“Welcome to the neighbourhood”. Fotos: Latitudes. 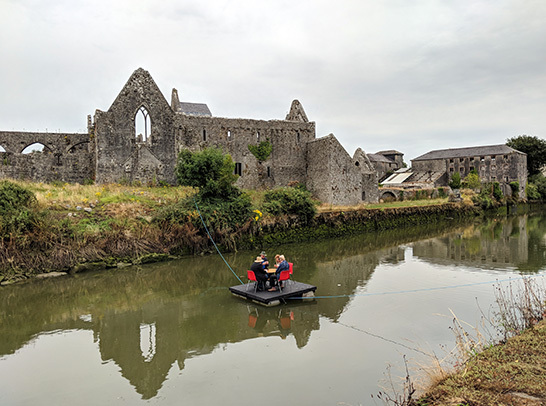 Latitudes participated in the 13th annual residency programme ‘Welcome to the Neighbourhood’ in Askeaton, Ireland, organised by curator and artist Michele Horrigan. 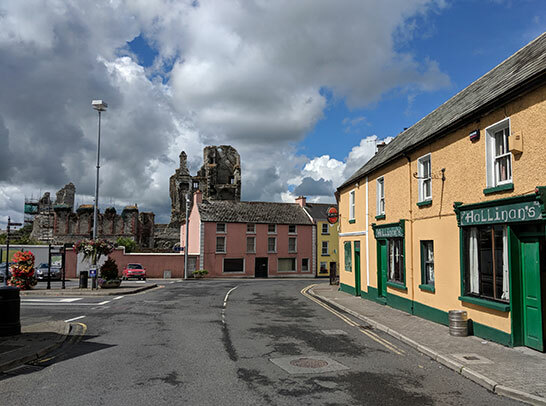 Each year Irish and international artists and curators respond to this small town in County Limerick. Full programme here. The 2018 programme also involved artists Matt Calderwood, Jonny Lyons, Ruth Clinton and Niamh Moriarty, and curator Gareth Bell-Jones. Latitudes’ contribution was triggered by a clue which led to an unexpected connection between Barcelona and Askeaton. This became a starting point rather than a conclusion. A textual splinter that is now pointing us towards future research around the navigators, pirates, traders, religions, and economies which linked Ireland with the Atlantic and western-Mediterranean sea-lanes during the last centuries. Written in stone at the cloister of the friary reads: “Here lies the Pilgrim’s body, who died January 17, 1784”. Carl Doran narrates the write-up from the 1984 ABC News, the town’s annual journal. 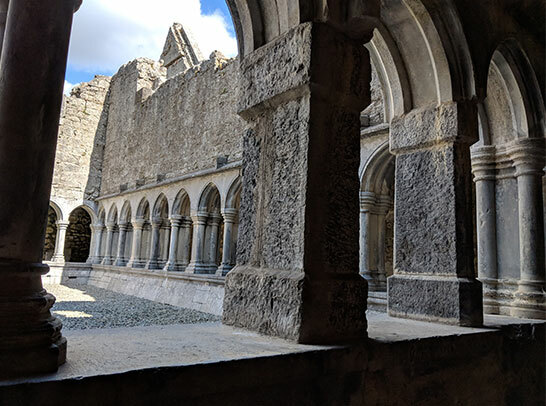 The Pilgrim tells of young love, clandestine marriage, and a blood-hunt that led a merchant from Barcelona to live out his days in penance in Askeaton. Presentation by Latitudes and Gareth Bell-Jones on their curatorial practices, Askeaton Civic Trust. 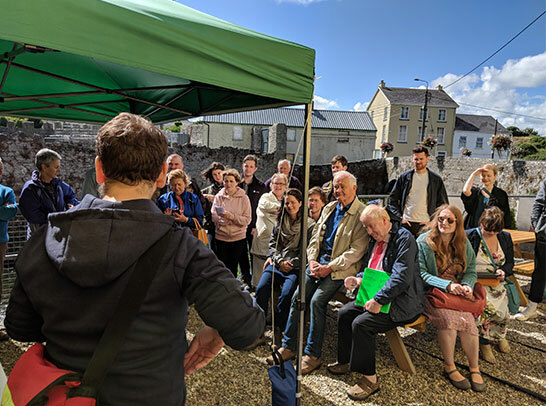 Open Reception at the Askeaton Civic Trust followed by a guided tour of Askeaton encountering new projects by artist-in-residence Matt Calderwood, Jonny Lyons, Ruth Clinton and Niamh Moriarty. “Welcome to the neighbourhood”. All photos: Latitudes. Latitudes participó en la 13a edición de la residencia ‘Welcome to the Neighbourhood’ ('Bienvenido al vecindario’) en Askeaton, Irlanda. Cada verano, una serie de charlas y visitas guiadas programadas por la curadora y artista Michele Horrigan, involucran a artistas irlandeses e internacionales en medio de la pequeña ciudad del condado de Limerick. Programa completo. La programación 2018 incluye la participación de los artistas Matt Calderwood, Jonny Lyons, Ruth Clinton y Niamh Moriarty, y el comisario Gareth Bell-Jones. La contribución de Latitudes se desencadenó por una pista que condujo a una conexión inesperada entre Barcelona y Askeaton, convirtiéndose en un punto de partida en lugar de una conclusión. Una astilla de texto que ahora señala hacia futuras investigaciones en torno a los navegantes, piratas, comerciantes, religiones y economías que unieron a Irlanda con las rutas marítimas atlánticas y mediterráneas occidentales a lo largo de los últimos siglos. Inscrito en la piedra en el claustro del convento se puede leer: "Aquí yace el cuerpo del peregrino, que murió el 17 de enero de 1784". Latitudes invitó a Carl Doran a narrar la reseña publicada en el ABC News de 1984, el periódico anual de la ciudad. “El peregrino” narra la historia de un amor juvenil, un matrimonio clandestino y una cacería de sangre que llevó a un comerciante de Barcelona a vivir sus días en penitencia en Askeaton. Presentación de proyectos de Latitudes y Gareth Bell-Jones, Askeaton Civic Trust. Presentación de la obra producida por los artistas en residencia. 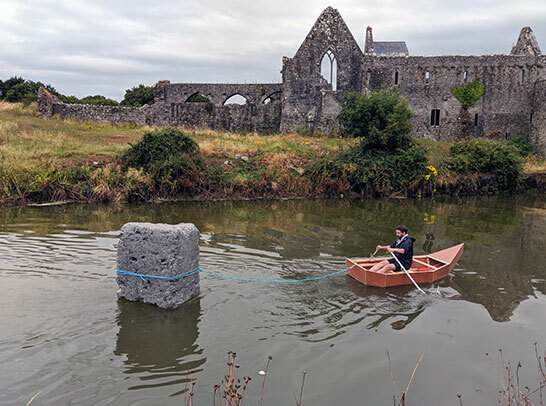 Recepción en Askeaton Civic Trust seguida por una ruta por Askeaton para descubrir los proyectos de Matt Calderwood, Jonny Lyons, Ruth Clinton y Niamh Moriarty.